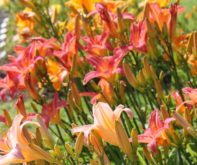 Center House has newly reopened with galleries, a teaching kitchen, a botanical library and classroom, and the gardens offer 26 display areas including perennials, thousands of annuals, rock, rose, pond, children’s and native plant gardens ? also rotating outdoor garden art exhibits, three greenhouses, an arboretum and a woodland preserve. Among the oldest botanical gardens in the U.S., it emphasizes native plants and offers classes, workshops, talks and ?events year-round ? a spring plant sale, the Fete des Fleurs Garden Party, the Grow Show in August, Harvest Festival and the Holiday Fair. Educational programs bring school children and teenagers to work with local farms and farmers, animals and plants. The garden is open on weekends year-round while the galleries are open and daily in season, 9 a.m. to 5 p.m. from May Day through Columbus Day, with tours 11 a.m. Monday to Saturday.